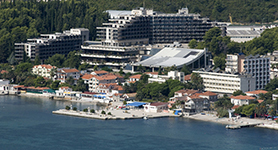 American Aesthetic Surgery Center Igalo in Montenegro is leading provider of the latest cosmetic and reconstructive procedures available today. We strive to give you more than beautiful results. Our goal is to change your life and give you the best possible experience with attention to all of your needs – medical, psychological, and aesthetic. From the moment you walk into our offices in Mediterranean Plastic Surgery Center, you will be pampered by our friendly, professional staff. We know that cosmetic procedures can make you nervous. We at Mediterranean Plastic Surgery Center are dedicated to putting you at ease and making sure that you feel comfortable and confident. Renowned celebrity physician, Dr. Borko B. Djordjevic, M.D., PhD., F.I.C.S., F.A.A.C.S., is an experienced plastic surgeon and specialist of cosmetic surgery who has taught internationally with surgical techniques honed to perfection and the sensitive touch of notion that “Beauty is measured in millimeters”.